Guardianship has become infested with greed and abuse. “Protection” and “conservation,” the ostensible and clearly understood purpose of protective statutes, have not and cannot be achieved in the present mode of operation. Everyone, including NASGA, agrees that lack of monitoring and oversight have been and continue to be the major problem. NASGA is working on a unique solution and will present it separately. At this time, we are confining our recommendations to other problem areas. Judges play a pivotal role at the commencement of a potential guardianship. When there are inter family problems, rather than immediately imposing a guardianship, some of these conflicts can be resolved by nonbinding mediation; others require due process hearings if there are allegations of wrongdoing. The precipitous or inappropriate/unlawful guardianship, commenced in face of these unresolved problems, is a disservice to the AIP, the family, the court system and the taxpayers. If judges were required to mandate immediate mediation for a disputing family upon filing of a petition for guardianship (temporary or permanent), many guardianships could be avoided - resulting in safety of the AIPs, a reduced caseload for the court, and peace within the family. NASGA urges expedited mediation, of a nonbinding nature, to avoid lengthy and unnecessary legal proceedings. If the mediation fails, then - and only then - guardianship may be appropriate, pending all required protections, which are too often overlooked. "Conserve" being an element of the protective statutes, failure to conserve must be punished. When there is no evidence of prudent investment (or any investment) and the estate is depleted to the point of indigence, the matter must be referred by the judge to the Medicaid Fraud Unit of the state in question. If a judge fails to take such action, he/she is guilty of misprision of a felony. If estates consist solely of government pensions (including Social Security), no fees or commissions should be taken from those funds which are intended for the care and upkeep of the ward, since upkeep allowances given to the wards and their families by guardians are generally inadequate in today’s economy. The courts must be mandated to first verify that all outstanding obligations and liabilities, including federal, state, and other taxes have been paid before authorizing any fee/commission payments to fiduciaries. Guardians who fail to pay estate taxes must be reported to IRS by the courts, and barred from all future fiduciary appointments. When a judge is found to have failed to so report, he/she is guilty of misprision of a felony. 26 U.S.C. 2002 imposes liability for payment of taxes on the executors of descendants’ estates. NASGA urges that the same liability be imposed on fiduciaries in guardianship. Guardianizing, incarcerating, and taking a person’s property contrary to law involves fraud, among other things. Fraud in petitioning, accounting or in any other area at any stage of the process must be criminalized. When wrongdoing is found in guardianship cases, the courts must refer fiduciaries to discipline or criminal authorities. When wards and their families are forced to go out of pocket to fight corrupt proceedings, recovery should come from the wrongdoers, not from the wards’ assets. In order to assure recovery against defalcation, bonding of professional fiduciaries must be mandated, with discretion regarding bonding of family-member guardians, so as not to discourage their participation. Criminal background checks must be done on all guardians, including family members. Professional guardians must be licensed and certified! Since “conservation” is a stated purpose for the promulgation of protective statutes, the money lure must be removed from the system. Tight annual fee and commission caps on earnings by attorneys and other fiduciaries must be put in place. Guardian caseloads must be cut to a more manageable level. All potential conflicts of interest, on the part of judges, guardians, or attorneys, must be disclosed in writing at the very inception of a proceeding, with mandatory disqualification. Questionable temporary guardianships are a growing phenomenon, even when there is no actual provable emergency. Family (and even the AIP) gets no notice whatever: the order is entered immediately without a hearing. These so-called “emergencies” will morph into permanent guardianships, still lacking due process. "Emergency proceedings require the following: actual notice to the respondent before hearing; mandatory appointment of counsel; establishment of the respondent’s emergency; conduct of a hearing on the permanent guardianship as promptly as possible; and placement of limitations on emergency powers. NASGA urges that a time limit for notice prior to hearing be imposed; i.e. within 24 hours of the filing of the petition/order, and sufficiently prior to any hearing, or the proceeding must be vacated. No individual should be adjudicated in need of guardianship simply on the strength of a written statement by a social worker, psychologist, physician, or other medical personnel without that person having actually examined the AIP, and being subjected to cross-examination under oath. Also, the AIP should have the unchallenged right to present testimony by an expert of his/her choice. The recent use of the word "incapacitated" has led to major abuse in guardianship. The only description which should properly be used to consider an individual for plenary guardianship purposes must be "mentally incompetent." As demonstrated above, it is critical that federal law control in order to assure provision of fundamentally fair, orderly and just judicial proceedings. 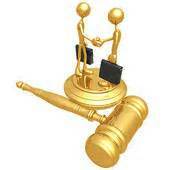 Judges must be made to follow the statutes completely, unless the statute provides specific discretion. Failure to comply should mandate vacatur, and discipline must follow. All protective statutes should specifically mandate the right to a jury trial, the right to confront and cross-examine witnesses, and use of the “clear and convincing” evidentiary standard. They should also provide information explaining the rights of AIP’s, in simple-to-understand language. NASGA members complain of a common problem – lack of notice of proceedings. They later learn that the petitioner, under oath, declared that no relatives exist. While failure of notice is a ground for termination of the guardianship or the proceedings, this type of fraud and perjury cannot be simply overlooked; it must be dealt with harshly. Assistance of counsel must be mandated: an AIP must have freedom of choice of retainer and means of providing legal fees (which is presently impossible when there is a rapid grab of assets in the new phenomenon of "emergency" guardianships). Fiduciaries proven to have harmed their wards’ welfare or mismanaged estates for their own self-enrichment must be penalized to the greatest extent permitted by law. Criminal indictments must follow and judges must apply punishment commensurate with the breach of trust engaged in by the fiduciary against the ward and public trust. Transparency is integral to rebuilding public trust in the judicial system. Even when court files are properly sealed, there should still be access to the clerk’s records, dockets or minutes of the proceedings which not only show what papers were filed but which provide evidence of jurisdiction. It is imperative that all guardianship files and records be open and available in the public interest. There should be no question about whose rights prevail in this area of law: the public’s interest must prevail over that of the individual, particularly because of potential Medicaid fraud with its attendant costly burden on the taxpayers. Additionally, once a guardianship is established, there should be no fear of outside identity theft. Transparency will aid in thwarting conversion of assets by fiduciaries as well. “Interested parties” must have total access to all records, including all inventories and accountings. Videotaping of proceedings should be allowed, as an alternative or in addition to stenographic transcripts. This would be an additional aid for post-hearing determination of capacity of an AIP. Because of the damage being done to victims and families, and because public distrust grows daily, the judicial grievance process must be made to work in the public interest instead of being cloaked in secrecy. NASGA recommends the videotaping of execution of all such documents for submission in evidence if capacity prior to execution is challenged. which are often improperly attacked regarding capacity at time of execution in guardianship proceedings. Filing a durable power of attorney, together with a videotape of its execution will end blatant judicial overriding of valid powers. Family members responding to a notice of hearing should be supplied with a copy of the protective statutes and court rules, so as to be able to understand their rights. Judges should be mandated to appoint family first and to select or approve a setting in the least restrictive environment, as required by statute, unless there is objection, in which case there must be a due process hearing; not just judicial overriding. The cost of home care with a Representative Payee should be weighed against guardianship and traumatic removal from home to a nursing or other facility. The cost savings to taxpayers could be massive as well. The family caregiver must be protected against eviction, and the home must not be sold when a family member is in residence. The Medicaid spend down should not permit or force sales of homes or leave spouses and dependents unprotected. Guardians who isolate or permit isolation or restricted visitation of their wards as a means of control or retaliation against family or advocates must be removed, barred from further fiduciary appointments, and punished. In connection with restricted visitation, families are generally penalized with the cost of guard duty. This is onerous and costly and smacks of pure retaliation.Restricted visitation or total isolation must only be permitted in specific cases where the ward is in actual proven danger from certain individuals, and only with court authorization. An expedited hearing for this specific purpose must be convened and the accused given notice and opportunity to confront accusers and be heard before such authorization can be given. What NASGA sees as one of the solutions to lawlessness by state courts is that Congress must clearly address the federal rights of our vulnerable citizens improperly detained in unlawful guardianships by amending the habeas corpus statutes to specifically protect potential guardianship victims. Doing so will afford a major solution to the rampant lawlessness encountered by our members. Additionally, exhaustion and other requirements must be waived for these vulnerable elders and disabled individuals. Some family members are compelled to litigate without counsel. Without a thorough understanding of the law, they can be taken advantage of by an unethical adversary. Since the judge is supposed to be independent and not partial, the pro-se litigant needs a source to which he/she can turn for guidance, other than the pro-se offices in the various courts, whose function it is to support the judge; not the public! Law school clinics could fulfill this function. Because there is no uniformity in state law in this area involving federal rights and protections, and because state legislators and law enforcement have not been receptive to individual complaints, a Federal Ombudsman office should immediately be created. Complaints by victims, family members and pro-se litigants can be lodged against civil and human rights violations, either in the Civil Rights Division of the Department of Justice, Department of Health and Human Services, the Federal Human Rights Commission, or creation of a special entity to act under a newly mandated federal standard for uniform guardianship.